3 Brothels, 3 Bold Claims. There are 3 brothels in Nevada all claiming to be “Closest Brothel to Las Vegas”. How can that be? Who really holds the crown? This claim is a huge feather in the cap of the winner. Why? Because Las Vegas is in Clark County, and in Clark county prostitution is illegal. However, there are places that are very close where prostitution is legal. So the claim to being closest to Sin City is a big one for bragging rights. We’re done playing around. It’s time to get to the bottom of this. The 3 brothels claiming the “Closest to Las Vegas” crown are The Chicken Ranch, Sheri’s Ranch, and The Love Ranch Vegas. 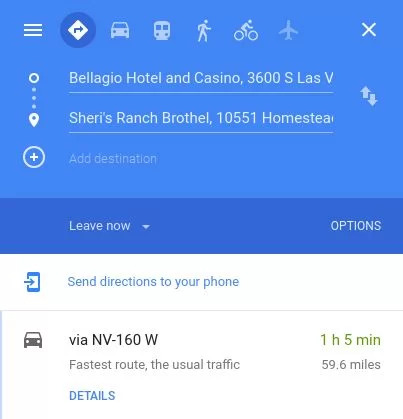 We used Google Maps with The Bellagio Hotel and Casino as the starting point. We chose The Bellagio since it’s on the World Famous Las Vegas Strip and right in the middle when looking at the main cluster of hotels on the west side of Las Vegas Blvd. The main cluster starting from The Mandalay Bay and going north to the Stratosphere. It’s also very close to the highway. We did the search on a Saturday when traffic wouldn’t affect the time results. The Chicken Ranch time from The Bellagio hotel was 1 hour 4 minutes taking NV-160 West, 59.4 miles. Sheri’s Ranch time from The Bellagio is… 1 hour, 5 minutes, 59.6 miles taking… you guessed it, NV-160 West. The Love Ranch clocked in at 1 hour and 25 minutes if you use US-95 North. 81.3 miles. Well, let’s rule out the Love Ranch, because it looks like it’s not the closest drive. So, what’s the deal with The Chicken Ranch and Sheri’s Ranch? Well, they’re literally next door to each other. As you can see, it’s a 4 minute walk between the two brothels. 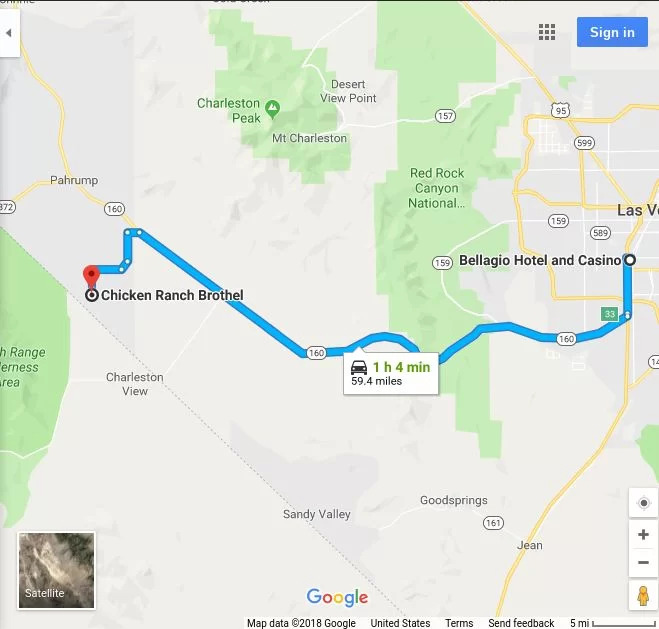 The way the directions sent us to Sheri’s from Las Vegas, we had to drive right past The Chicken Ranch. This is the reason why it doesn’t matter what part of Las Vegas you come from. We chose the Bellagio, but even if we picked another hotel, it wouldn’t matter. You have you drive right past the Chicken Ranch. Let’s see if we took a route that didn’t take us past the front door of The Chicken Ranch. Not easy, unless you cut through the dirt street in between the two brothels. So let’s check this alternative route 2 for Sheri’s Ranch. The results of our alternative route to Sheri’s Ranch? 1 hour 9 minutes without traffic. However, it was 58.7 miles. So you might be saying, well it takes longer, but its less mileage than The Chicken Ranch. So let’s try the same alt route for The Chicken Ranch. We get the same 1 hour 9 minutes, again, check the “without traffic”. But the clincher here for The Chicken Ranch if you’re looking at mileage, is 58.5. Winning yet again. So The Chicken Ranch Brothel takes 2 out of 2 so far. Both time and distance. Let’s take a look at “as the crow flies”. In other words, if you didn’t have a car and were-… a crow… staying at The Bellagio. Okay, so we’ve exhausted this enough. According to our calculations, that’s 3 of 3 for The World Famous Historic Chicken Ranch Brothel for “Closest Brothel to Las Vegas”. Although all 3 offer free limo rides from the Strip, so you don’t have to worry about any of this.